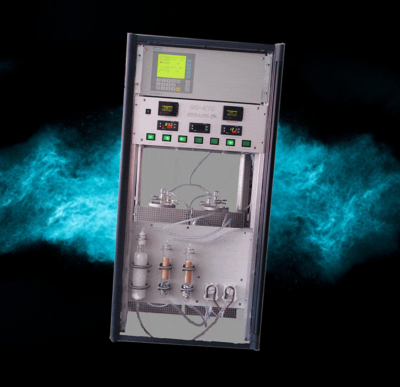 In the field of gas analysis, we offer measuring devices for the online measurement of CH4, CO2, O2, SO2 and ATC (total carbon content in gas) as well as other chemical gas constituents. Not only our own and patented measuring methods are used, but also patented solutions for the preparation of sample gas. The sample gas conditioning system receives the necessary attention in order to rule out cross-sensitivities of the analyzers and to ensure repeatable measurement results over the entire service life of the measuring instruments. A gas sample (ca. 120l/h) is continuously drawn from the gas to be analysed (1). The gas flow is evenly divided between the symmetrical/parallel running Measurement- (2) and Reference Channels (3). The gas flow in the measurement channel is passed through a reactor (4) which has been heated to 1.000° C and is filled with a catalytic, coated substance. 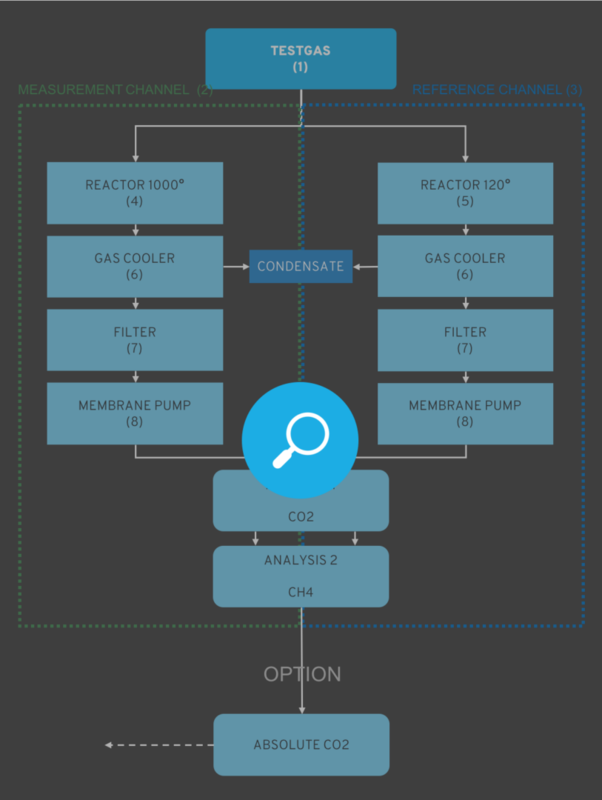 In the reference channel, the gas flow is passed through a reactor (5) which has been heated to 120°C to avoid deposits of water or hydrocarbons. 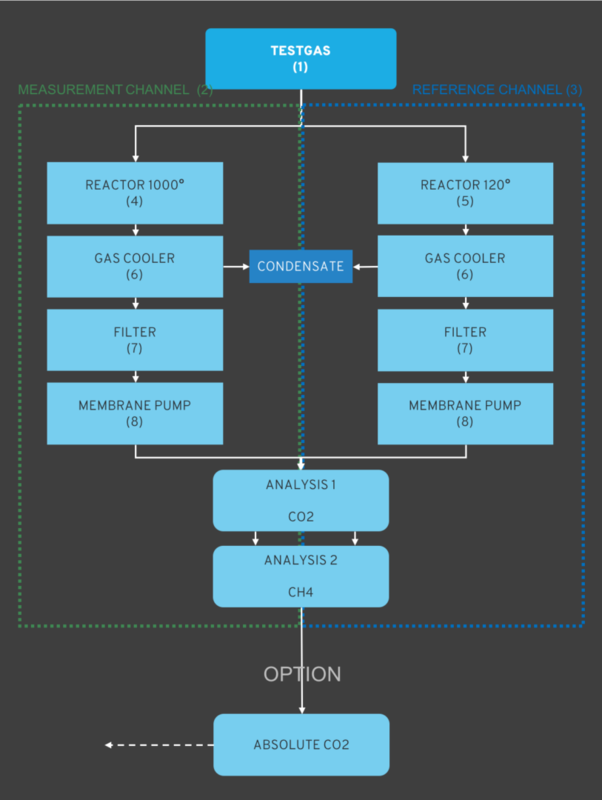 Subsequently, the measurement/reference gas is passed through a gas cooler (6) for drying (the resulting condensate is drained off), and afterwards it is passed thought the filter (7) to remove acid and particles. Then the mass flow rate is controlled by means of membrane pump (8) and flow control. Analysis 1: The CO2 concentration of the gas in the test bulb is compared with the reference bulb by means of a CO2 measuring cell. Analysis 2: Likewise, the concentration difference of CH4 (methane) is determined by comparing the reference bulb to the test bulb. Absolute CO2 Measurement (Option) In addition to measuring the THC, the determination of the absolute concentration of CO2 in the test gas is an optional feature. For this measurement, the gas flow is redirected from the reference bulb to the test bulb of a second test system. The measurement of the absolute CO2 concentration in the test gas is possible, because it is compared to the reference gas in the reference channel.